October's Barclays Manager of the Month award nominees. 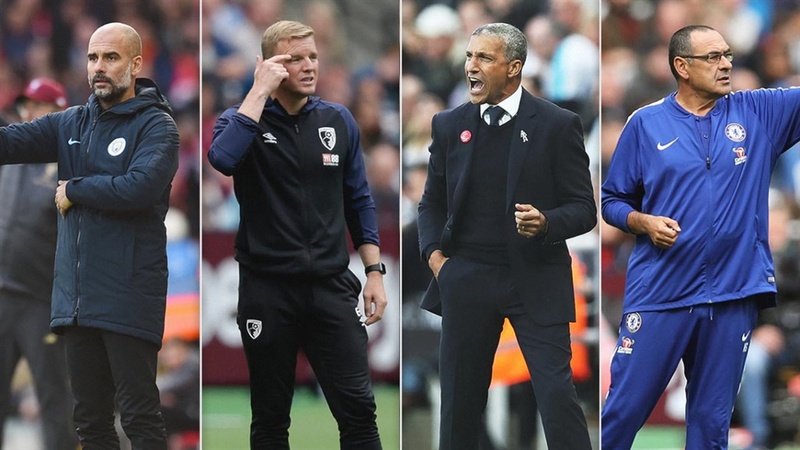 Managers of Manchester City, Chelsea, Bournemouth and Brighton & Hove Albion have been nominated for October's Barclays Manager of the Month award. Four men have been nominated for October's Barclays Manager of the Month award. Unsurprisingly, Manchester City manager, Pep Guardiola tops the list after the Spaniard’s hardest month this season reaped seven points for Manchester City. In getting those seven points, they became the first team to stop Liverpool scoring and winning at Tottenham Hotspur. Eddie Howe also makes the list after masterminding AFC Bournemouth maintaining their good form this season with three wins and one draw. Howe’s AFC Bournemouth also became the first team to win at Watford this season. Three matches, three wins, all by 1-0, as Chris Hughton went back to basics to end a five-match winless run and record a club-first treble of PL victories for Brighton & Hove Albion. His is perhaps the biggest surprise, perhaps the most intriguing among the feats achieved. Maurizio Sarri also continued his unbeaten start to PL life, as Chelsea recorded convincing wins at Southampton and Burnley and a thrilling draw with Manchester United.